Originally from Southern California, Tuling explains how she found her way to the rabbinate. “I was volunteering in my congregation, which I loved, and working in a career I disliked. 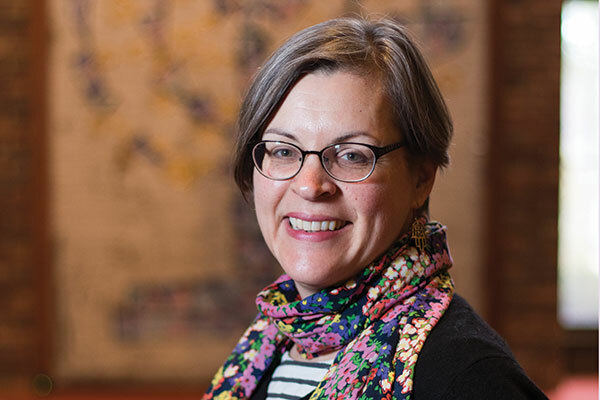 It occurred to me, rather suddenly, that I could change this situation.” She received her ordination in Cincinnati in 2004 and using the rabbinical placement service, she served as rabbi in a congregation in Middletown, Ohio. Tuling arrived in Plattsburgh in July of 2012 as the sixth female rabbi to serve the local congregation. She earned her Ph. D in Jewish Thought in 2013. She is also the Jewish Chaplain, Hillel Co-Advisor and an Adjunct Instructor at SUNY Plattsburgh. Tools of the trade: A prayer shawl, a rabbi’s manual, a set of prayer books, and a library of Jewish books. Favorite thing about being a rabbi in the North Country: I really like that the congregation is very supportive of one another and will show up to help those in need. We are a bit isolated here, so it’s great that congregants do not have to face a death, a crisis or an illness alone. Lesson learned the hard way: Not every situation can be fixed. It’s easy to keep hoping that a relationship will improve, but that is not always possible. Best advice: The best advice I received when I moved here was to take up a winter sport. My friend said I’d be glad when it snowed, and sad when the spring arrived. As a result of that advice, I discovered that I love snowshoeing. And it’s true. I always want more snow. My real job description: Be there, in body and spirit, when someone is in need of a caring presence in their lives. Community involvement: I am the immediate past president of the Interfaith Council of Clinton County, which also runs the Interfaith Food Shelf. I am also the Vice President of Membership of the Women’s Rabbinic Network, which advocates on behalf of female rabbis. My strengths: I do my work with honesty and integrity, with the full attention of my intellect and the deepest sincerity of my heart. I can be shy. I am both an introvert and an extrovert all at once — I love talking to everyone in the room, but I also need time alone. How I stay current in my field: I am often called upon to teach about the nation-state of Israel, yet the situation in Israel keeps changing and evolving. Regular trips to Israel help me stay current. Also, I preach on a weekly basis, so it is necessary to keep studying and learning to make sure that my material does not go stale. I find that it is very important to be eternally curious. Advice for women pursuing the same career: It can be tough to be a female rabbi, because it’s very likely that you will experience sexism in the course of your career. People often assume that the experience of sexism is a bit like playing a sport where the referee is biased against you. It might be harder to score points, but you have a shot at being considered a part of the team. The reality is that sexism is more like being told by the coach (or the players or the fans) that you don’t actually belong on the field at all and should pack it up and go home. Sexists tend to attack your very competence and question your right to pursue what you do, so much so at times that you feel like you were foolish to think that you can play at all. My advice to women pursuing the same career (or any other career) would be to resist that assessment of your skills. It is just sexism talking. If you have earned your ordination, then you have earned the right to be there, doing what you do.